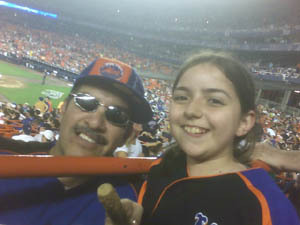 I was planning on writing a brilliant article tonight, and I figured I'd have plenty of time to write it after taking my daughter to the Mets game against the Arizona Diamondbacks. 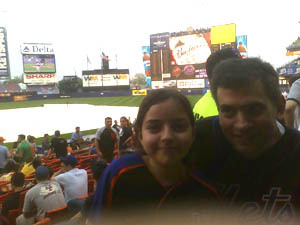 Well, the game started a half hour late due to an earlier rainstorm, and then just after the Mets took a 4-1 lead in the second inning I felt a drop of water on my arm, looked up and saw what looked like an ocean-size bucket of rain aiming for all our heads. Abby and I ran for cover, along with the rest of Shea Stadium, and waited out the delay before returning to our wet seats for a teetering, crazy game that ended in a classic Mets-style ninth inning come-from-behind (Endy Chavez got on base, Jose Reyes got a huge hit, Paul LoDuca advanced Reyes to third, and Wright knocked Reyes home for the game-winning RBI). So, I'm now too exhausted to post anything literary, but here are a couple of cellphone photos. 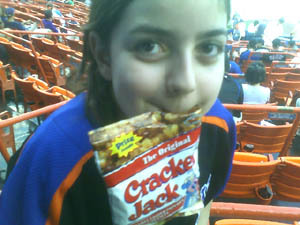 I have no idea why Abby is eating the bag of Cracker Jacks instead of the contents. And that's the Cowbell Man, a local legend, in the last photo. 7 Responses to "Delay For Rain"
rainstorms and suchi keep planning to write brilliant things and am sidetracked by rainstorms and similar occurrences for weeks now. nice to see i'm not the only one. and nice to see those faces! and that's the way it is...in one small, sane corner of Americana tonight. go yankeesgo yankees.... looks like you guys had a great time ... awesome. By the way, Bonds record does not count. We did have a great time, thanks. I agree about Barry Bonds, and I'm afraid I have no idea what you're talking about re: Yankees ... haven't heard of the team. nd then caught at the wall. And they get a late run and win three to two. Usually it's not that close and Oakland's got an easy lead so in the seventh inning they take out the great Reggie Jackson and put George Hendrick in right field for defense and to rest Reggie. We all run out to right and cheer like mad for George like he's the guy we waited all game to see. And he's our favorite player 'cause all he gets to do is carry around the shoelaces of the great one. I suppose he's embarrassed and thinks we're stupid and probably right but somehow he reminds us of ourselves. The last game I see is a slow-moving dull paced affair that's tied two to two for about forever, since the forth inning or so. Then our slick little shortstop makes an error and they go up by one. We're used to that, finding a way a lose, whatever it takes. Somehow miraculously we get a run to tie it and it stays that way up through the eighth and ninth. For some reason we stay, I don't know why, not like we don't have to go to work tomorrow and gonna be tomorrow pretty soon. And not like it means anything since we got a lock on last place and nobody can take that away from us. Then in the bottom of the tenth big Don Baylor gets ahold of one and crushes the ball sending it high over the centerfield wall. From where I am you can see it hit on the pavement of the empty parking lot and bounce up high and then disappear into the dark. Yippee we won, so what. Even Angels don't lose all the time." beautiful photos!and Mets and Arizona Diamondbacks... that's beisbol, no?